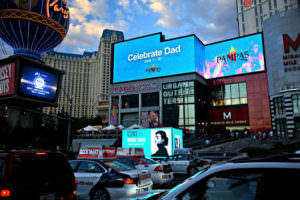 Digital Advertising Las Vegas - Drive Traffic with Digital Mobile Billboards! Get Noticed Where Only the Big Names Used to Be..
Advertising in Las Vegas can be tough – if you don’t know the best kept secrets of the most successful advertisers on the strip and throughout the valley. Most small businesses, restaurants, clubs and shops don’t have the unlimited budget to pay for (and keep) traditional billboard advertisements or signage due to the limited billboard properties along the Las Vegas strip, along I-15 and along city streets. But if you watch carefully in the hottest spots in Las Vegas, you’ll see some smaller players – mom and pop shops, small club owners, and the “little guys” showing up right in the middle of the hoards of visitors looking for the next thing to see & experience in Las Vegas. Digital Advertising Las Vegas – Puts the “Little Guy” up with the Big Players..
Never before has it been so easy – and cost effective for ANY business in Las Vegas to get the exposure that only the big names used to be able to get on the Las Vegas Strip and throughout the city. In fact, our Digital advertising assets are so effective even the big names hit us up to increase their exposure for their casinos, big events and promotions. You’ll often see some of the biggest and most successful shows like David Copperfield, Celine Dion, Blue Man Group, and Cirque du Soleil (among many others) advertising on our digital mobile billboards along the strip. They know our digital advertising assets are effective, and they keep coming back. But the best news is, that because our assets are digital (even on our trucks) the setup and time before display is almost nothing. With traditional billboards there are huge costs for printing, wait time, delivery time and also a huge time commitment for the billboard rented. Not for us.. our digital adverting Las Vegas mobile billboards and LED building displays allow us to upload and display your ads in no time. We can create a schedule rotation for your ad that will hit the right spots at the right time to attract the attention of the right people. Let us show you what we can do..
Our Digital Mobile Billboards Shine – We Get Attention!